The first book in her very own series begins with Macy's sixth birthday and follows the adventures of her and her friends. The girls will develop and learn the importance of strong friendships, honesty, and compassion. On occasion, they make mistakes, but they have loving and strong families who always lend support and direction.The upcoming year for Macy and her friends will be filled with lots … of fun, many teaching moments, and the joy of seeing life in the way only rambunctious and joyous six-year-olds can.Macy Casey and The Pretend Triplets is the first in a series of books about the life of an only child, Macy Casey. Since she has no siblings, she considers her best friend Gracie her sister. 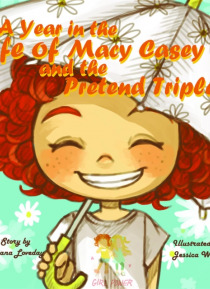 Since their names rhyme, and Macy loves a good rhyme, they consider themselves twins. Eventually they meet another six-year-old girlwith a rhyming name, of courseand they become pretend triplets.